It’s funny being on a panel that creates an audible gasp from the audience. That’s what happened the other day at the Mountainfilm Festival coffee talk Sunday on Climate Solutions: 3 Under 30. Erin Barnes, ioby’s cofounder and Executive Director (who is actually not under 30), joined Slater Jewell-Kemker, director of An Inconvenient Youth (very much under 30); and Gregg Treinish (also not under 30), a National Geographic Adventurer of the Year and the founder and executive director of Adventurers and Scientists for Conservation shared their work with an audience that was most definitely over 30. At one point, Erin made the point that all is not as dire as we once imagined, and that real change is happening, using the example of Millennial preference for a better smart phone or computer over car ownership. And there it was: the group gasp. Weird. We thought everyone knew this. Enterprise advertisement in NYC subway in June 2013. StreetsBlog, of course, has done several pieces that include roundups of the press on this issue, including stories in CNN Money, the LA Times, citing research by J.D. Power and Associates, PIRG, and others. So the auto industry knows, car-sharing people know, and people who care about transit know, and Millennials know. 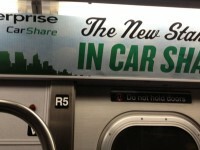 Enterprise knows, which is why they’ve created their own car-sharing system. But some people, regular people who don’t work in the new sharing economy or the auto industry, may not know that car culture is dramatically changing. So keep talking about it. It may be shocking news!